Valued at $800 to subsidize the cost of purchasing meals and groceries. The University has five student villages which are a 10- to 15-minute walk from the main classroom buildings. AIFS students are housed in Plassey Village, the number one choice with students. One or two AIFS students live with 6 or 7 Irish students or other international students in a townhouse to foster integration into the social life of the full-time Irish students. Housing is mixed male and female. You will have a single room with its own key, and you will share a kitchen, living room and bathroom facilities. Each townhouse has cable T.V. and each room has broadband connection available for no extra fee. The community village hall located at the heart of the village is also available for events, dinners and get togethers with your neighbors. A local supermarket offers a weekly shuttle service to and from the student villages for students doing their grocery shopping. All campus facilities are a walkable distance from the student villages. A public bus from the University takes 15 minutes to Limerick city and runs until late. Public transport is inexpensive as are taxis. Students will receive a meal allowance of $800 to subsidize to subsidize the cost of meals and groceries. There are restaurants and cafes on campus or you can cook with your housemates. Students who wish to opt out of the meal allowance will receive a discount of $800 from their program fee. Each student is assigned to a full-time student (a “UL Buddy”) who will help them to settle in. Joining one of the 70 dedicated clubs and societies run and managed by students for students is also a great way to make friends and integrate into the student community. AIFS students can make a difference to their community and gain valuable practical experience as well as transferrable work-related skills by participating in the President’s Volunteer Award Scheme. It’s also a great way to get to know real Irish/Limerick people. Depending on the number of hours committed to volunteering, students will be awarded with gold, silver or bronze. The award will be listed on the UL transcript at the end of the semester. Dia Dhuit!–that's how we say hello in Irish (I also speak English and a little bit of German). I have been the AIFS Resident Director since 2004. 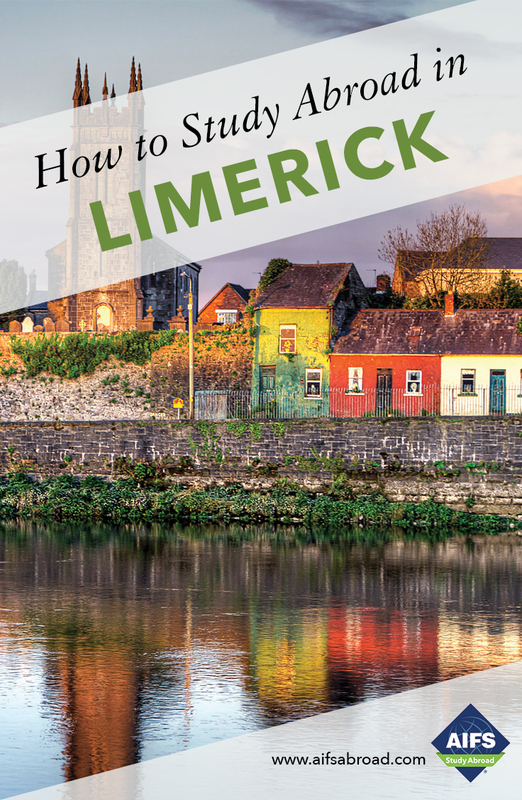 I can't wait to show you the beautiful city of Limerick, I'm sure you'll feel at home right away. I know Limerick very well after growing up here and obtaining a BA and graduate diploma in Adult Education from Mary Immaculate College, the sister college of the University of Limerick. You will find that while the culture is different, there isn't a significant language barrier so your integration into local cultural life will be much easier. You can think of me as a support for you both personally and academically for any issues that may arise. It's my goal to make your transition into Irish culture as seamless as possible. In my free time you can find me enjoying a good book or cheering on my favorite rugby team. During your time abroad I will coordinate all aspects of the program including academic planning, housing and social and cultural activities. See you in Limerick! Because health and safety are top priorities at AIFS, at least one member of the AIFS staff at this campus has taken a first aid course in order to be available to help any student until a doctor or nurse can provide help. This is just one of many services that we provide to our students.